October is Learning Disabilities Awareness Month. 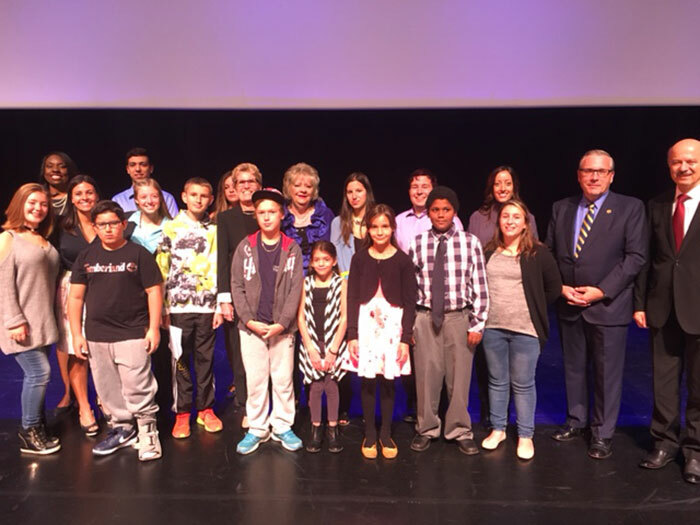 The Grade 4-7 students in Andrea Orsi’s ISA (Intensive Support and Assessment) classroom at St. John Paul II CES in Richmond Hill produced a video that was featured at the Learning Disability Association of York Region’s 40th Anniversary Celebration on September 26, 2016. 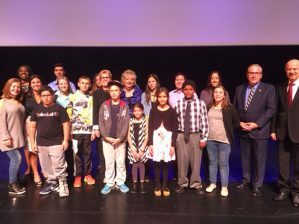 The students also attended the anniversary celebration, where their video was played, and they met the Premier. Morgan, a Grade 5 student, and Madison, a Grade 8 student from Our Lady of Grace CES in Aurora also performed at the anniversary celebrations. The two siblings performed a duet. 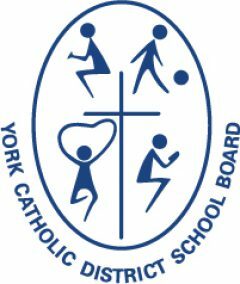 The following is a message that the St. John Paul II students wrote about this experience and to help further raise awareness about learning disabilities. We are students in Grades 4-7 and we would love to continue to spread awareness that a learning disability just means that some people “learn in a different way”. We are very intelligent children and are capable of doing so much! We have so many talents and skills that make us unique individuals. In our class, we focus on self-advocacy skills and find ways that best suit our learning styles. There are so many different strategies that students can use to make learning more fun, engaging, and successful. As a class, we decided to create an iMovie that would teach others about a variety of learning strategies that we use on a daily basis. We hope that you will watch our iMovie and find some of these strategies useful. It makes us feel very proud to be able to inspire others to do their best. 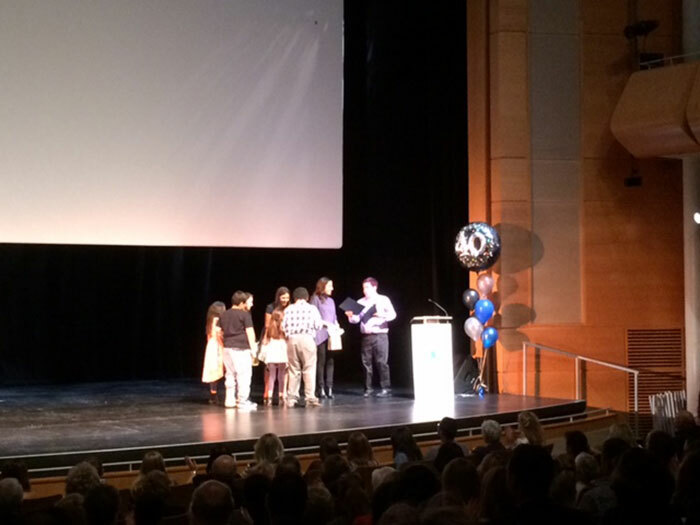 We feel honoured that our iMovie was featured at the Learning Disability Association of York Region’s 40th Anniversary Celebration in September. This was a once in a lifetime opportunity that we will remember forever. It was amazing to watch our video on the big screen and to have the audience applaud us, and all of our hard work! Hi, I’m Alyssa and I am in Grade 5. I had a fun time making the iMovie, because I got to pick the parts that I wanted to include. I decided to include Audio Books for the reading strategies section, because it’s a great way to help others to learn how to read. I want other students to try using audio books because I think that it will help them learn to read. Having our iMovie featured at the LDAYR’s 40th Anniversary Celebration made me feel happy, cool and special because a lot of people were watching it! I’m Levi and I am in Grade 6. I liked making the iMovie because it was a very good use of my class time. I enjoyed filming the movies and taking the pictures that we included in it. I felt proud that I was responsible for picking the classroom activities to present in the iMovie. We used Google Docs to create a chart that outlined all of the concepts we wanted to include, what videos and pictures went along with that idea and also what script best described each clip. I was very excited to see our iMovie at the 40th Anniversary Celebration, because I worked so hard to put it all together. My name is Nathaniel and I am in Grade 6. I enjoyed making the iMovie, it was a lot of fun. I suggested that we use the “MSQRD” app, which allowed us to add some cool effects to our faces. When our iMovie was featured, this part of the movie made the audience laugh. It made me feel amazing to know that my creative ideas added laughter to the audience! 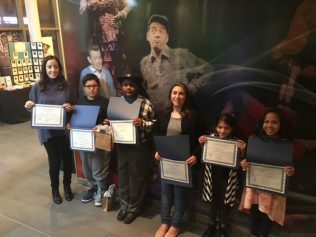 The reason why we created the iMovie was to inspire other children to try their best, believe in themselves and to believe in and follow their dreams. Anyone can do anything they want to do as long as they try hard enough and persevere through any challenges. I’m Keira and I am currently in Grade 5. My favourite part of creating the iMovie was sharing the different ways we use our leadership skills in the ISA Program. I love teaching others about technology! My favourite part of the iMovie was when we taught Read & Write Google to a whole bunch of teachers at Ed Tech Day at Cardinal Carter CHS. I loved the picture of when I was in their lockers. The audience’s reaction of laughter made me feel famous! Making the iMovie was a lot of fun and it will be something I will remember forever. 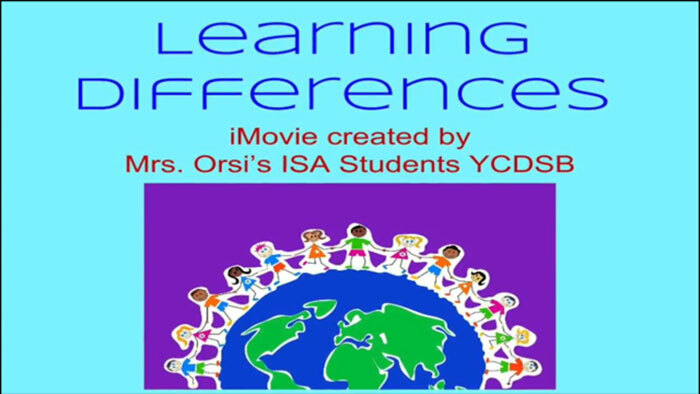 I hope that when other students watch this iMovie, they will learn that there are many strategies to use to help with any learning differences. My name is Michael and I’m a Grade 7 student. When I first started in the ISA program, I knew I had some strengths and I knew I had some areas to improve in. Just a couple of years ago, I couldn’t imagine being where I am today! 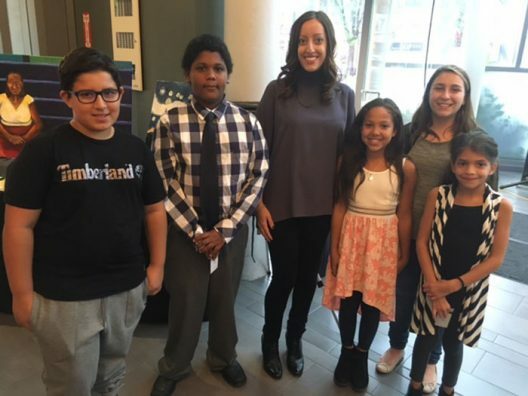 I am currently in Grade 7 and I am happy to say that I am now able to teach others the strategies I learned in the ISA program. My confidence level has increased so much by helping others. Guiding others makes me feel really good about myself because it reminds me of how much I’ve learned and how far I’ve come. This iMovie was the perfect chance to show other students how they can also come a long way once they put in the effort. Hello, I’m Joseph and I’m in Grade 7. I have fun teaching other students about learning differences, because I know it’s going to help them. It will help them in school right now, but also in the future. For example, they may not need to use a certain shortcut on the keyboard right now, but in a later project, they may remember the strategy and use it then. If anyone is struggling in school, there are always different strategies that they can use to help them. Remember, no matter how unreachable your goals seem, you can always do it! My name is Adrianna and I am a Grade 7 student. 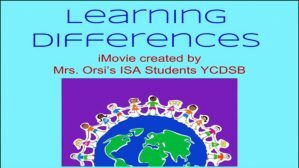 I really enjoyed creating the iMovie about learning differences. The idea to create this iMovie all started because of a speech I wrote while I was in Grade 6. The topic of my speech was “my experience in ISA”. We used my speech as an outline for the video. We used many of the strategies that I mentioned in my speech and modeled them through videos and in pictures. This made me feel really proud because I worked really hard on my speech and I was able to share my positive experiences with other children. Since the iMovie was based on my speech, I was chosen as the narrator for the video. I thought this was such a cool experience! Hello, I’m Josiah and I’m in Grade 7. The thing I liked most about creating this iMovie was that I was able to act in it. I really enjoy acting because it is a lot of fun and I don’t often get the chance to. By teaching other students the strategies that we learn in our classroom, other students can try to use the same strategies to help them learn. This makes me feel really good about myself because I love helping others. If I could give advice to other students, I would tell them that no matter how hard something may seem, you should keep pushing forward. This means, keep trying your best and don’t give up! You can do it! We thank-you for taking the time to watch our iMovie. We hope that it was very inspiring for you and that you could use some of these strategies to help you learn. Remember, that everybody learns in different ways. It is important to find the strategies that work for you. If you put in the effort and persevere through challenges that may come your way, you will be successful. Follow your dreams!